Neurofibromatosis type 2 (NF2) is a heritable disease complicated by intracranial neoplasm. Although intracranial aneurysms have been described in patients with neurofibromatosis type 1, such is not the case with NF2. We report a case of NF2 and an unruptured middle meningeal artery (MMA) aneurysm in a 36-year-old male patient. Because management of these particular aneurysms is both variable and infrequently reported, we elected to obliterate the aneurysm before meningioma resection by using n-butylcyanoacrylate (NBCA). A 36-year-old black male patient was seen at an outside facility for weakness of his right upper extremity. During his workup, which included cranial MR imaging, he was found to have multiple intracranial masses. He was then referred to our institution for treatment. Physical examination revealed an alert and oriented gentleman with normal cortical and higher cognitive function. Cranial nerves III–XII were intact. A right cataract was noted. With the exception of light and darkness discrimination, visual acuity was absent on the right. The left visual field examination demonstrated decreased temporal perception. Motor strength was remarkable for right-sided triceps, grip, and interosseous weakness. Sensations to touch, pinprick, and vibration, as well as gait and reflexes, were normal. He denied any history of head trauma, and family history was positive for a brother with NF2. The patient was therefore diagnosed with NF2 as established by family history, multiple (presumed) meningiomas, and cataract (1). Review of the MR imaging findings demonstrated multiple, enhancing masses consistent with meningiomas involving the parafalcine region, bilateral sphenoid wings, and tentorium. The right sphenoid wing mass invaded the right cavernous sinus, encasing the right internal carotid artery and the right superior orbital fissure. Cerebral angiography, which was performed to exclude tumoral involvement of the superior sagittal sinus, revealed a 4-mm aneurysm that arose from the anterior division of the right MMA (Fig 1). No tumoral blush or vascular pedicle originated from the aneurysm’s parent artery. Lateral (A) view of the right MMA superselective angiogram demonstrates a 4-mm aneurysm (arrow) arising from the anterior division of the MMA. Following NBCA embolization, the NBCA-filled aneurysm does not opacify on the lateral (B) projection of the right CCA angiogram. The patient granted written, informed consent for elective, staged surgery entailing initial endovascular obliteration of the MMA aneurysm followed by craniotomy and parafalcine mass resection. The patient was brought to the angiography suite. Angiography and aneurysmal embolization were performed under intravenous conscious sedation by using intravenous fentanyl citrate and midazolam hydrochloride. Blood pressure, electrocardiographic patterns, arterial oxygen saturation, and respiratory rate were continuously monitored. Using a transfemoral artery approach, a 5F platform catheter was placed within the right external carotid artery. Four thousand units of heparin were given intravenously. Biplanar, fluoroscopic, roadmap-guided, selective cannulizations of the right MMA and the anterior division of the right MMA were achieved with a 0.01-inch Agility microguidewire (Cordis Neurovascular, Miami, FL) and a 1.5F UltraFlow microcatheter (Micro Therapeutics, Irvine, CA). With the microcatheter wedged within the anterior division of the MMA and just proximal to the aneurysm, this catheter was prepped by using 3 mL of D5W. Next, 0.5 mL of a 4:1 mixture of iodized oil (Cordis Neurovascular) and NBCA (Cordis Neurovascular) with added tantalum powder (Cordis Neurovascular) was injected through the microcatheter for 5 seconds under subtracted biplane, fluoroscopic guidance. Filling both the aneurysm and the adjacent parent artery with the acrylic glue, the microcatheter was then aspirated and quickly withdrawn. A control right common carotid artery angiogram demonstrated complete embolization of the aneurysm. The patient was transferred to the intensive care unit for observation. He remained neurologically unchanged, with the exception of a mild right-sided headache that resolved within 36 hours. On postoperative day 3, the patient underwent craniotomy for resection of the parafalcine mass via an interhemispheric approach. On pathologic evaluation, the mass was found to represent a fibrous meningioma. Following an uneventful hospitalization, the patient was discharged 5 days later. Both true and false aneurysms of the MMA are rare lesions. The nontraumatic or true aneurysm represents the least common of the two types, with only 17 previously documented cases compared with 31 peer-reviewed reports of the post-traumatic, false, or pseudoaneurysm variety (2–5). Although 70% of the pseudoaneurysms are associated with a fracture that extends across the temporal region of the MMA, the etiology for the true MMA aneurysm remains unclear and possibly multifactoral (5). In a review of the literature, true MMA aneurysms have been found in conjunction with meningioma, Paget disease, angioma, Moyamoya disease, cavernous hemangioma, hypertension, posterior cerebral artery occlusion, and dural arteriovenous malformation, whereas in four additional cases no ascribed abnormality was detected (2–4). A potential high-flow state exists for several of these cofactors. As a result, Kahara (4) has speculated that these aneurysms are probably flow related. Although descriptions of the histologic evaluation of these aneurysms are exceptionally rare, Sandin et al (2) reported that the microscopic analysis of a nontraumatic, ruptured MMA aneurysm from a patient with hypertension was notable for a fibrotic aneurysmal wall, discontinuity of the media and internal elastic lamina. In the two published accounts of concurring MMA aneurysm and meningioma, both cases described the MMA aneurysm arising from the tumoral vascular pedicle. Our case differs in this regard, because tumoral vascularity did not derive from the aneurysmal parent vessel. Nevertheless, it is plausible that a generalized high-flow state existed due to the presence of multiple, hypervascular, intracranial neoplasms. The association of NF2 and intracranial aneurysm has not been reported. NF2 occurs in 1 of 30,000–50,000 individuals who harbor a mutation in the NF2 tumor suppression gene. This autosomal dominant gene is located on chromosome 22q12, which accounts for tumorigenetic development of schwannomas and meningiomas (1, 6). Clinical diagnosis of NF2 is determined by the presence of either bilateral vestibular schwannomas (1) or a first-degree relative with NF2 plus a vestibular schwannoma, at age <30 years (2), or two of the following: juvenile posterior subcapsular lenticular opacity or juvenile cortical cataract, meningioma, glioma, or schwannoma (7). Approximately half of all NF2 cases are familial (6). The mean age at diagnosis is 22 years, whereas the mean age of death is 36 years (8). True and false aneurysms of the meningeal arteries have been identified in conjunction with epidural, subdural, subarachnoid, intraparenchymal, and intraventricular hemorrhage (2, 9, 10). 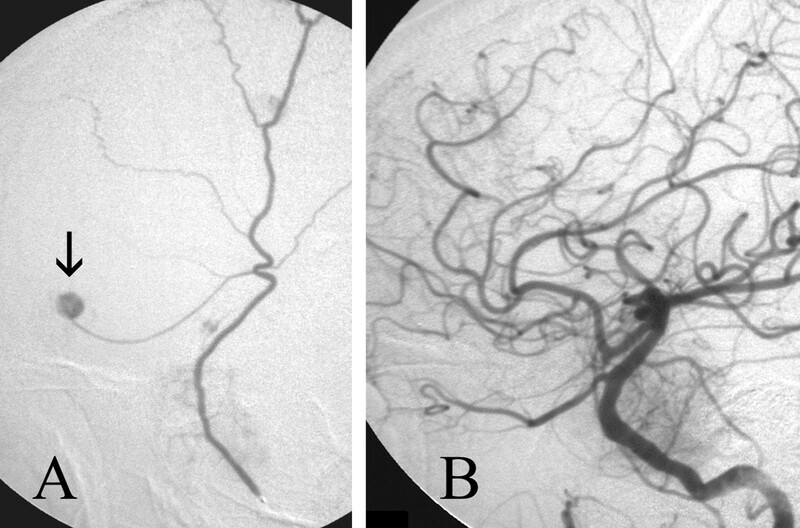 Although the natural history of these aneurysms remains unclear, that these aneurysms are rarely reported and, when so, are frequently found in the setting of intracranial hemorrhage has prompted others to conclude that treatment should be performed on any ruptured or unruptured, true or false meningeal artery aneurysm (2, 4, 10, 11). Meder et al (12) have estimated that the mortality rate could be three times lower if these aneurysms were treated before rupturing. Our decision to prophylactically treat the MMA aneurysm was based primarily on the need to reduce the potential risk of aneurysmal rupture during craniotomy and dural manipulation for the parafalcine meningioma resection. Aneurysms of the MMA have historically been managed by vessel or aneurysmal ligation, coagulation, or resection (2). Less invasive means of therapy now exist because of the evolving improvement of endovascular techniques and materials. Endovascular embolization of MMA aneurysms has been reported in five separate case reports, and of them, one involved the extracranial MMA (3, 5, 10, 12, 13). Various materials were used for embolization including gelatin sponge plugs, straight and fibered platinum coils, and polyvinyl alcohol particles. NBCA acrylic glue has been applied successfully in the treatment of aneurysms located in other arterial territories such as the lateral posterior choroidal artery (14). NBCA has distinct advantages compared with these other materials, as it can be delivered through a smaller microcatheter, which promotes distal access. Equally important, acrylic glue allows the surgeon to fill both the aneurysm and the parent artery, thereby reducing the tendency for vascular recanalization. MMA aneurysms can be safely and effectively embolized via an endovascular approach by using NBCA acrylic glue. NF2 may be a risk factor for the development of intracranial aneurysm. Presented at the 7th Annual Joint Meeting of the American Association of Neurological Surgeons, Congress of Neurological Surgeons and the American Society of Interventional and Therapeutic Neuroradiology, San Diego, CA, 2004. Accepted after revision January 14, 2004.